Have you ever wondered what the Bibbidi Bobbidi Boutique on a Disney Cruise experience would be like? Every Disney Cruise offers incredible entertainment, this however was the most magical part of the trip for me! 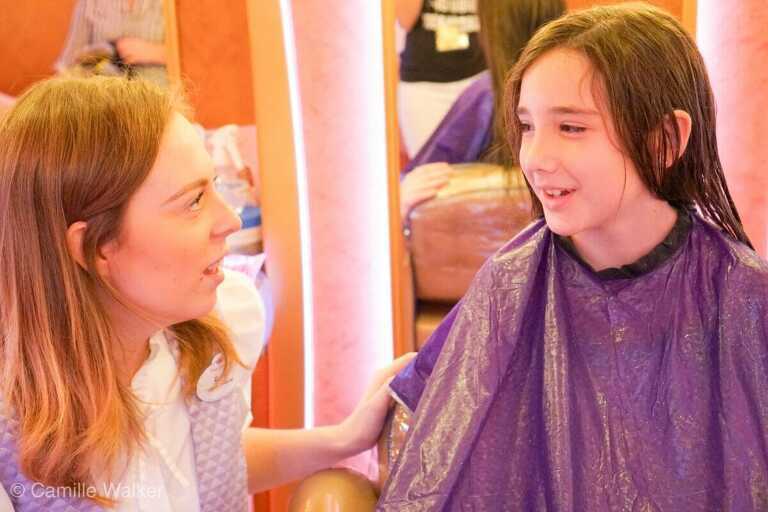 Learn all about what to expect of the Bibbidi Bobbidi Boutique on a Disney Cruise and why this may be a “must” on your next Disney bucket list. It is no doubt that Disney has first class service and is known for hosting the very best cruise experience a family could ever have. When we were invited to Disney’s Creator Days as a guest we were offered a few choice experiences while we were there. One of the ideas listed was to experience Bibbidi Bobbidi Boutique. I had always wanted to take my daughter to experience the boutique but felt that we had plenty of magic to experience without it. I am so grateful this opportunity allowed me to make it a reality because it was the most Disney Magic I felt the entire trip! WHY? WHY would this be so when we had the fireworks, the food, the gorgeous atmosphere? It was because of the cast. Every Disney employee is known as a cast member and every Disney employee I’ve ever known has been wonderful. The kind of wonderful you want to take a picture of and wrap all the warm fuzzies up so that on a cold winter’s day you can pull them out to remember them. Ray was our special fairy godmother at the Disney Dream’s Bibbiti Bobbiti Boutique. She was warm and gentle, curious and feminine, and most importantly we was kind. Jayne isn’t the type to open up right away; she is shy and cautious and not a big fan of attention. Ray had her walking through clouds of her imagination as she asked her about her favorite Disney princess, recounted characteristics of all of her princess pals and made Jayne feel like she was royalty by no stretch of the imagination. They discussed her family, her likes/dislikes, and what she hopes to be when she grows up. It was somewhere in the middle of this interaction that I became a complete teary mess. Jayne has three brothers. She has learned how to hold her ground, fight back, tease like a sailor, and play hard. She has also yearned for a sister, desperately wanting tenderness, silly lip sync battles, and stuffed animal tea parties. Too often I have told her to toughen up or I’ve assumed she doesn’t need more tenderness than her brothers. Watching her with Ray I realized how young and full of magic she is. This is the portion of time that Jayne was telling Ray her plans for the future. After fixing her hair, painting her nails, and changing her outfit Jayne was given a special set of jewelry “gifted to her from Ariel.” This jewelry changes in the sun to Ariel’s favorite color and it was now Jayne’s to enjoy. None of these pictures are staged. This really was her reaction! Trust me when I tell you what fun it was to see the glimmer of magic in my eight year old’s eyes. She received a matching hair piece and was give the reveal for the first time to see her sparkling new do. I took her to the splash pad on the Disney Dream to pose with her new look. She was so excited to look just like Ariel! 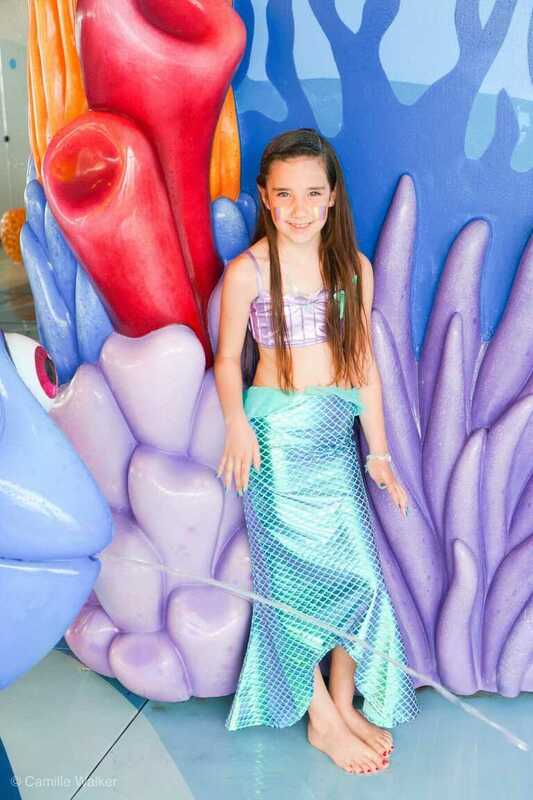 She has long been her favorite princess, so experiencing this transformationon the Disney Cruise right on the ocean was as close as it gets to the real thing! In her package she was able to keep her new Ariel swimsuit, fin, jewelry, sash, sunblock, towel, comb, and a backpack. I would highly suggest you give the Bibbidi Bobbidi Boutique a try and if you can…request RAY. She is an English gem and I promptly told her I want to be her bestie and watch the Christmas specials with her on Christmas Day. She was so personable and truly magical. I am so grateful we had this experience, we will remember it forever. What can you expect as a guest at Bibbidi Bobbidi Boutique? You will be asked to come with clean hair and nails. Each experience comes with different options to turn into a Disney princess, Knight, Pirate, Captain or mermaid. Your appointment is set up just like it would be at a regular salon, so please show up on time and be ready for magic! There are opportunities available for both boys and girls! I think the Disney Cruise offers really fun options because you can become a pirate, a captain, or a knight! *All package components and related information, including costume sizes, experience duration and prices, are subject to change without notice. You can make your reservation through the cruise line here. Your appointment will last about 45 minutes or so and if you do happen to choose the princess option over the mermaid option I would suggest you take your pictures in the royal chair mid ship or at the sweet’s shop Vanelopes! To remember the event I bought myself a pink rink made out of a pink shell and a matching shell bracelet for Jayne that we use to remember to stay kind and gentle. Book your own Disney Cruise and start experiencing the magic! 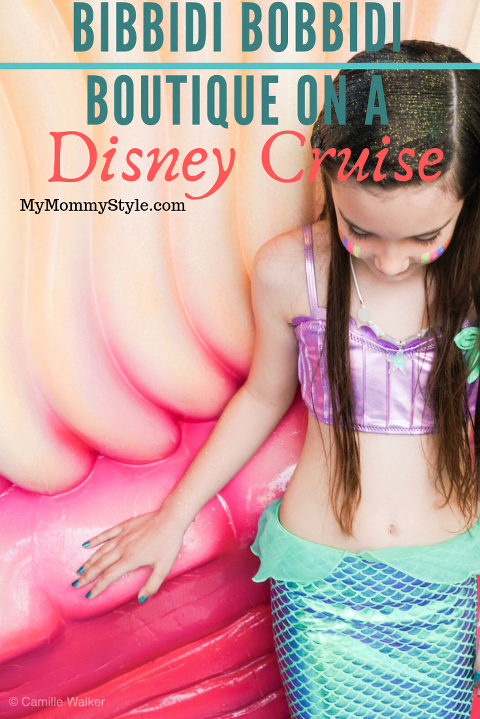 Are you thinking about going on a Disney Cruise? Check out this ultimate packing list so you don’t forget a thing! Thank you to Disney for inviting us as guests on the Creator Days. All opinions are my own.